A Top Thing to Do in San Diego! You have not gotten to know San Diego until you fly overhead getting the lay of the land. Do this amazing airplane adventure early in your trip. After booking, connect Immediately to our Tour Pilot to answer any questions via text or phone. 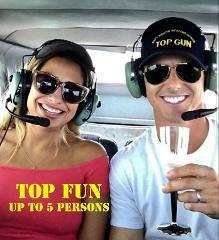 You can talk with our informative Military Pilots with exceptional backgrounds. Enjoy a comfortable vintage hangar lounge, suitable for bringing family /friends to hang out. You will gain a better understanding of San Diego and its Geography. You will check off the best Bucket List item and have the most fun doing it. A once in a lifetime experience! 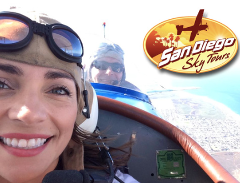 Fly Aerobatics in San Diego! 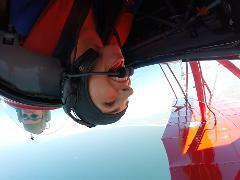 Loops, and Rolls, in an open cockpit vintage biplane with an experienced ex-military pilot while enjoying the best tour of your life. Includes: a 40-50 min flight (approx) Just show up at the airport, meet with the pilot in the pilot lounge for an introduction and brief, and fly the flight! Your friends and families can share as you embark on your adventure. Free Coffee is available. Availability: Based on pilot availability but usually 7 days a week and holidays. Please use the Book Now feature to select your optimum date and times.